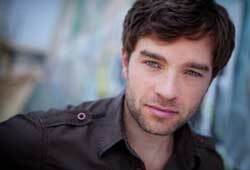 Hadley Fraser is an actor and musical theatre performer who made his West End debut as Marius in Les Misérables. Last October he played Grantaire in the 25th Anniversary concert of Les Misérables at the 02 Arena. He has recently been appearing in Les Miserables at the Queen's Theatre playing Inspector Javert. Fraser is also part of a band called the Sheytoons which he has formed with Ramin Karimloo. Fraser holds a BA from Birmingham University and a Postgraduate Diploma from the Royal Academy of Music. Other theatre credits include: Stephen Sondheim’s Assassins, The Far Pavilions, The Shaughraun, Pacific Overtures, My Fair Lady, Putting it Together, The Pirates of Penzance, Little Shop of Horrors, the Blues Brothers, Tiernan in the Broadway show The Pirate Queen and he appeared in the 25th Anniversary production of Les Miserables at the 02 Arena. He has just been appearing in the Chichester Festival Production of The Pajama Game.